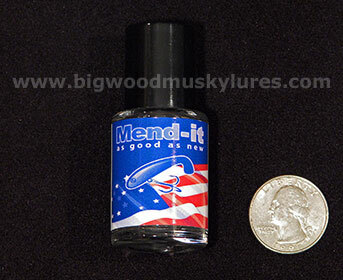 Description: Mend-it is a money saving "non-glue" that binds soft plastic baits together by chemically melting them, creating a catalyzing action between the pieces of plastic treated with Mend-it. Mend-it dries clear, soft and strong. Leaving the mended bait as good as new! Mend-it won't stick to your skin, clothing, boat or carpet so it can easily be used wherever and whenever you need it. 1/3 oz. single bottle. 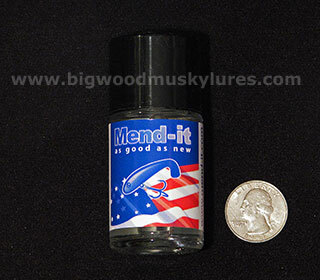 Description: Mend-it is a money saving "non-glue" that binds soft plastic baits together by chemically melting them, creating a catalyzing action between the pieces of plastic treated with Mend-it. Mend-it dries clear, soft and strong. Leaving the mended bait as good as new! Mend-it won't stick to your skin, clothing, boat or carpet so it can easily be used wherever and whenever you need it. 1 oz. single bottle.